Technology innovation and adoption are two very different things. While there’s always a new cutting-edge solution hitting the market, not every IT environment has the infrastructure to keep up with the latest innovations. Software defined networking is still a relatively new concept and many data centers may not be equipped to take advantage of SDN and all it has to offer. Download Mindsight’s new white paper to learn more about how to prepare your data center for software defined networking. In this white paper, we walk through a real-life example of how to evolve a data center in three phases to take advantage of SDN. Along the way, we discuss the core concepts surrounding software defined networking, network virtualization, and data center modernization. 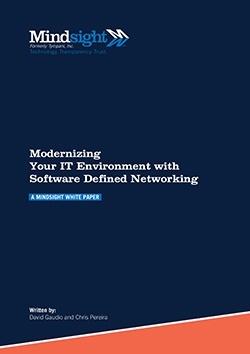 Fill out the form and get your copy of Modernizing Your IT Environment with Software Defined Networking sent directly to your inbox.